The nonprofits competing in the second Google Impact Challenge have some pretty innovative ideas for how to make the Bay Area a better place to live. And Google's method of soliciting votes for the contest is pretty cutting edge, too. 72andSunny created "digital paper" posters that people could press to make real-time votes in over 15 neighborhood spots, including restaurants, coffee shops, bus-station shelters and food trucks. The idea was to get as many community votes as possible, and actually getting out into the community accomplishes that much better than only doing an online vote. 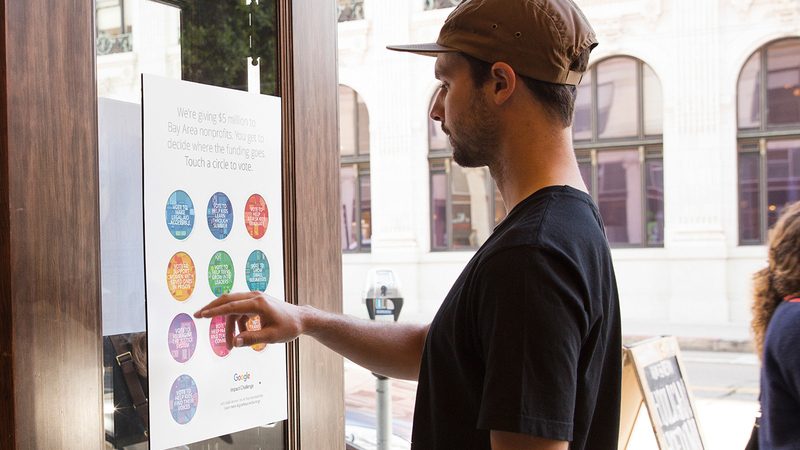 "Each voting activation gives a local community a voice in creating a better Bay Area," says 72andSunny group creative director and partner Matt Murphy. 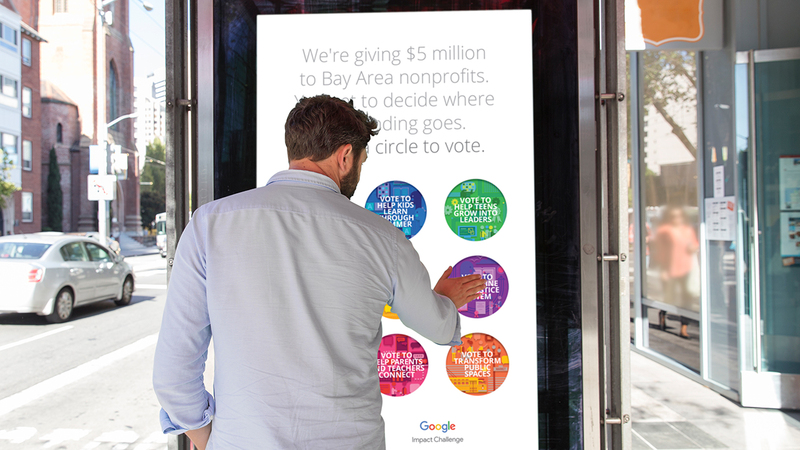 "The digital paper posters made voting easy and engaging, and by stationing each in local hubs, we not only maximized exposure, but also stayed true to Google.org's commitment to equal access for everyone." Lab Partners, a design studio run by San Francisco pair Sarah Labieniec and Ryan Meis, made the icon illustrations for the posters. Online voting is open on a website also designed by 72andSunny. Voting continues through Oct. 20. The top four vote getters will receive $500,000 in grant funding, while the other six will get $250,000 each. Some 15 more will each receive $100,000. All of the nonprofits will receive support from Google volunteers and co-working space at local Impact Hubs. The proposed projects include converting a liquor store into a community-based tutoring center; building a residential alternative to prison to break the poverty-to-prison cycle; and providing millions of dollars of 0 percent interest loans to small businesses.